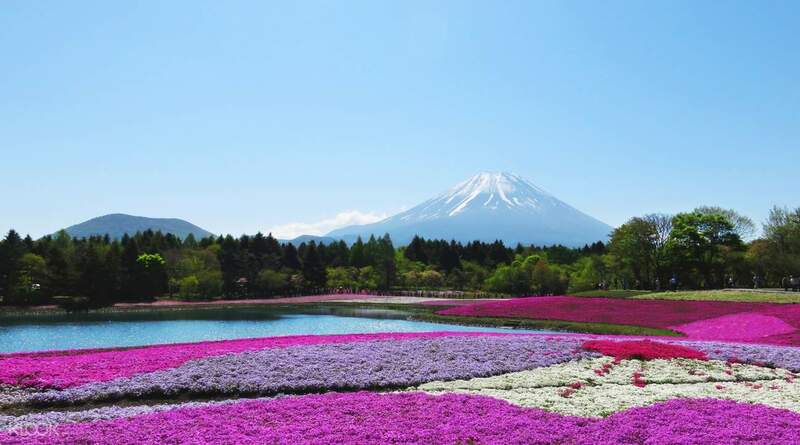 Visit popular sightseeing spots like Fuji-Q Highland and the Kawaguchiko Excursion Ship "En Soleil"
Get extra discounts to 12 additional facilities - simply show your Mt. Fuji Pass! Get a free pass to major sights and attractions around the Mt. Fuji area with the amazing Mt. Fuji Pass! One voucher gives you access to a number exciting activities and convenient transportation for your choice of 1, 2, or 3 days, giving you just the right amount of time to check places off your bucketlist. Get free entrance to Fuji-Q Highland, home to the world's steepest rollercoaster, and Grinpa, a child-friendly amusement park at the base of Mt. Fuji itself! Not only do you get access to sightseeing facilities, but simply showing the pass also gives you exclusive discounts to an additional 12 tourist attractions! You'll definitely make the most out of your Mt. 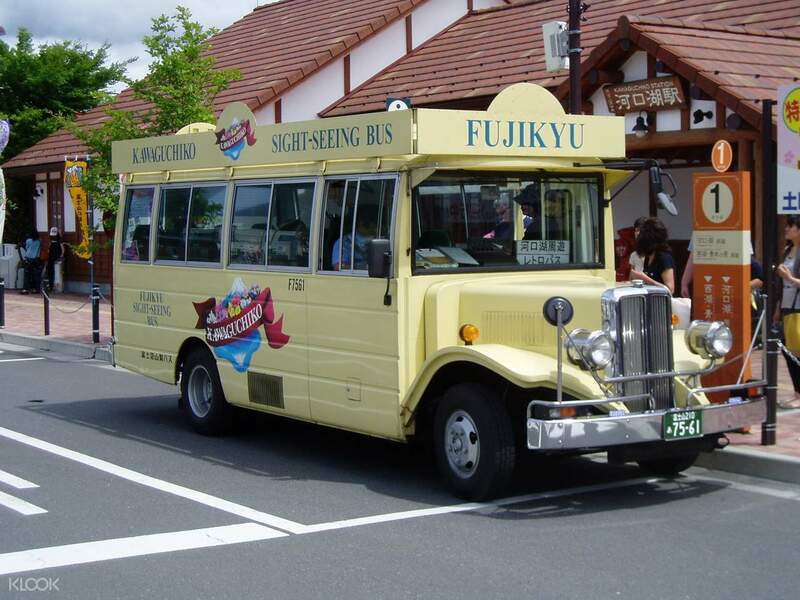 Fuji trip for an amazing price. 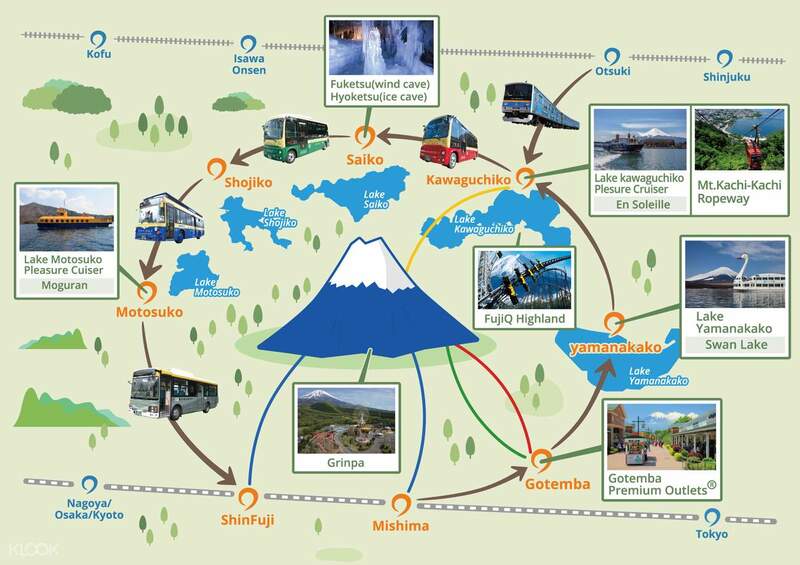 Enjoy free admission to Fuji-Q Highland, Grinpa, Fujiyama Museum, and more with just one pass! Lake Kawaguchiko Pleasure Cruiser "En Soleil"
Great value for its price with access to virtually all the activities and transportation in the area. Perfect for DIY tours without the hassle of hustling with a large group and being forced to stop at souvenir shops. You are responsible for your own time and itenerary so its essential that you research well prior to the trip. Pay particular attention to train schedules as they do not arrive as frequently as the trains in Tokyo. If you're looking to go to Mt. Fuji and do your own thing, this is the perfect pass. It'll give you access to the best and most well known locations, transportation getting there, and then some. Great value for its price with access to virtually all the activities and transportation in the area. Perfect for DIY tours without the hassle of hustling with a large group and being forced to stop at souvenir shops. You are responsible for your own time and itenerary so its essential that you research well prior to the trip. Pay particular attention to train schedules as they do not arrive as frequently as the trains in Tokyo. If you're looking to go to Mt. Fuji and do your own thing, this is the perfect pass. It'll give you access to the best and most well known locations, transportation getting there, and then some. We took a bus from Shibuya which was so comfortable, with free wifi and a lot cheaper than taking the train. By the time we arrive tried to pick up our Mt. Fuji Pass. They scanned my voucher and asked us to sign our names. And done we are all set for our Mt. Fuji Adventure but hunger took over and so we had some delicious ramen noodles from the station. All of the stuff at the station were very accommodating and super helpful. But we didn’t get to see and finish all of the other passes. But at least Mt. Fuji showed it’s beautiful self all day. We took a bus from Shibuya which was so comfortable, with free wifi and a lot cheaper than taking the train. By the time we arrive tried to pick up our Mt. Fuji Pass. They scanned my voucher and asked us to sign our names. And done we are all set for our Mt. Fuji Adventure but hunger took over and so we had some delicious ramen noodles from the station. All of the stuff at the station were very accommodating and super helpful. But we didn’t get to see and finish all of the other passes. But at least Mt. Fuji showed it’s beautiful self all day. Very easy to redeem at the Otsuki station of Fujikyu Line. 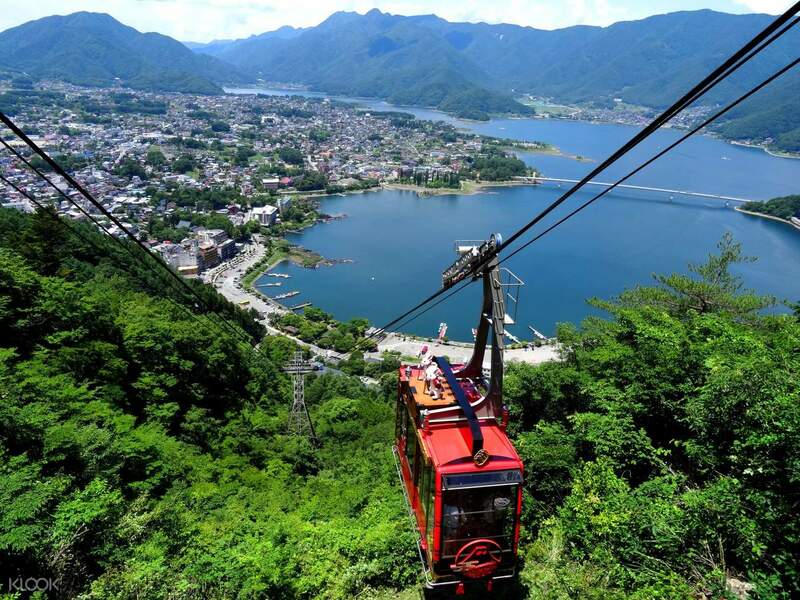 It is really convenient to use this pass as you can can just show it to enter Kachi Kachi Ropeway, Fujikyu Highlands and the fujikyu trains. Just make sure you go to Kawaguchiko as early as 8am so you can maximize the attractions you can redeem on this pass. Very easy to redeem at the Otsuki station of Fujikyu Line. It is really convenient to use this pass as you can can just show it to enter Kachi Kachi Ropeway, Fujikyu Highlands and the fujikyu trains. Just make sure you go to Kawaguchiko as early as 8am so you can maximize the attractions you can redeem on this pass. Our Mt. Fuji visit is so memorable because of the beautiful scenery. We also cruised around where we sighted Mt. Fuji. Weather is also nice and cooperative giving us a enough cloud to cover up too much sun heat. This is a must-visit in Japan. Btw, this Klook pass also includes entrance to FujiQ Highlands. Thanks, Klook! Our Mt. Fuji visit is so memorable because of the beautiful scenery. We also cruised around where we sighted Mt. Fuji. Weather is also nice and cooperative giving us a enough cloud to cover up too much sun heat. This is a must-visit in Japan. Btw, this Klook pass also includes entrance to FujiQ Highlands. Thanks, Klook! wonderful experiences with mount fuji, this pass is very good use, we travel from hotel to other location, and use pass on rope ride and boat ride for free. wonderful experiences with mount fuji, this pass is very good use, we travel from hotel to other location, and use pass on rope ride and boat ride for free. Amazing value for money pass however need check bus schedules and plan itinerary intricately otherwise cannot squeeze in the main attractions due to limited transport at times! Amazing value for money pass however need check bus schedules and plan itinerary intricately otherwise cannot squeeze in the main attractions due to limited transport at times! We didnt able to see mt fuji because it was cloudy that day but we did enjoy using the pass. It was easy to use and its worth it because we visited plenty of places around kawaguchiko area. We didnt able to see mt fuji because it was cloudy that day but we did enjoy using the pass. It was easy to use and its worth it because we visited plenty of places around kawaguchiko area.